Since my last entry in 2014 (yikes), we have been to St. Lucia, Dominican Republic, Jamaica (again), Turks and Caicos, Walt Disney World, Universal Studios and Jamaica (again). This year we have travels planned to Cancun (x2) and are considering a cruise right now. So I have a LOT to catch up on in terms of blog posts and reviews. I actually have notes in my phone from most of the travels, so I should have some pretty good content for you…starting now! I just had the pleasure of returning from a short FAM trip to my beloved Jamaica. As you may recall, I spent a week there back in 2013 touring all of the Sandals and Beaches properties on the island. Things have changed since then, especially in the Ocho Rios region. 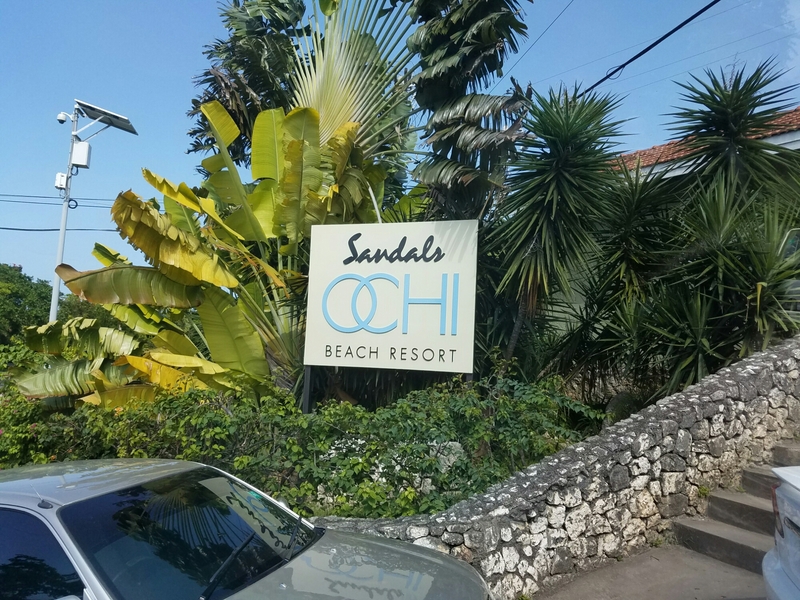 We were given the opportunity to spend 3 nights at Sandals Ochi Beach Resort, which used to be Sandals Grande Riviera until it was renamed and renovated 2 years ago. Many of my thoughts from that original post remain intact, and most of the changes made were relatively small in the scale of the resort. There are 16 dining options for resort guests and I didn’t have ONE bad meal! Kelly’s Dockside is no longer exclusive to Butler suite guests, but DOES require reservations. Some of the restaurants were renamed and reimagined; I had a delicious dinner of shrimp & grits, catfish and red velvet cake at The Southern Table (formerly Bayside). 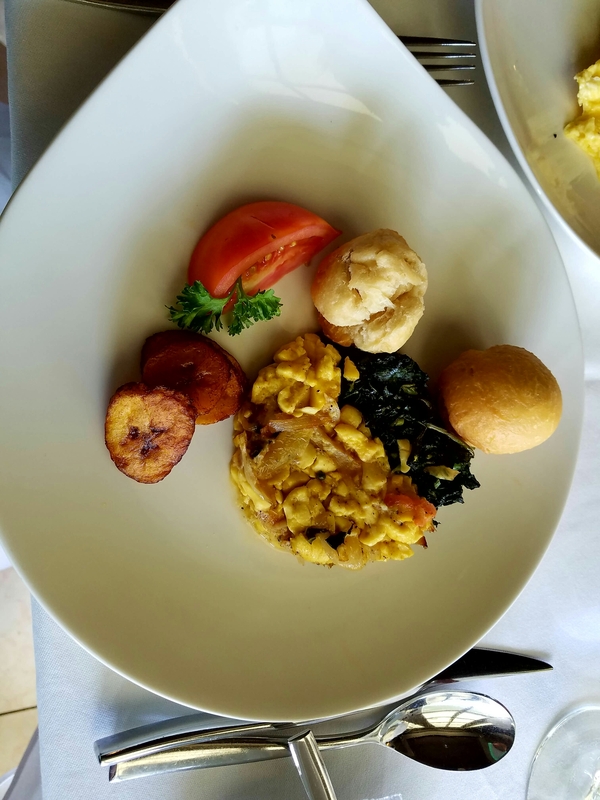 I had an incredible “Local Breakfast” at Le Gourmand French Restaurant, which consisted of ackee and saltfish, callaloo, fried plantains and johnnycake. (I am kicking myself for not going back there before I left, btw). 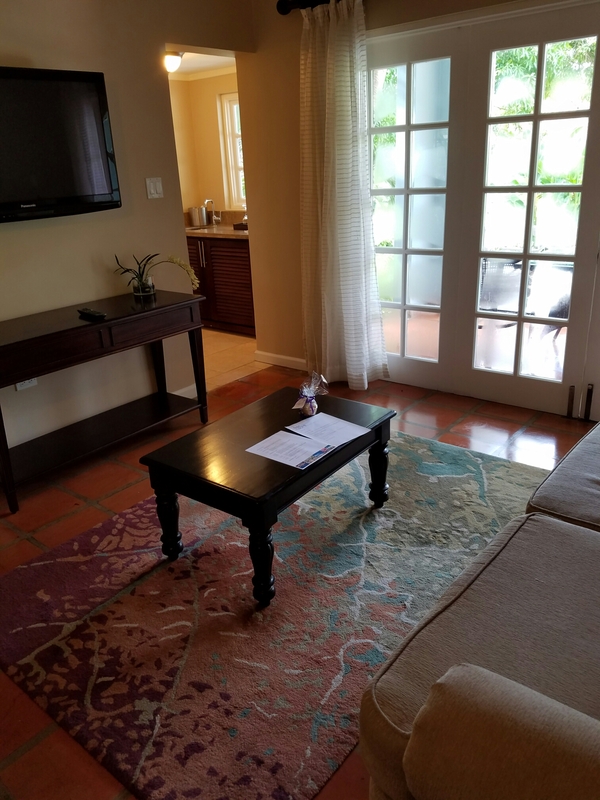 For our stay, we were all placed in one bedroom poolside villa suites, which offered a separate living room, bedroom, en-suite bathroom and mini bar. There was a villa pool that is shared with the other 3 villas in your block, so these rooms would be AWESOME for a group to book! To get around the resort, you would call a Hop…a vehicle a bit larger than a golf cart to take you down to the main building. There, you could board a bus to go down to the other two resort sections, Riviera Seaside and Ochi Beach Club. 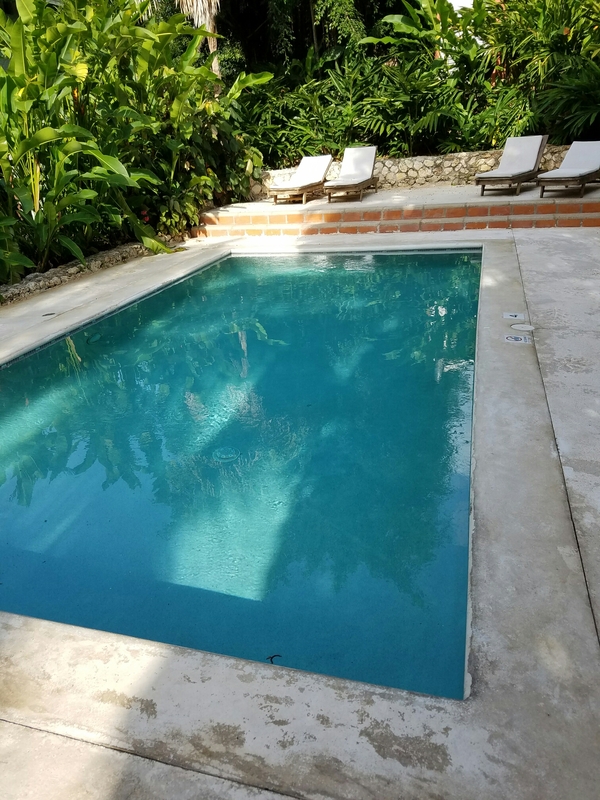 Because I loved the pool at the Great House (the hillside section of the resort where we were staying), I didn’t venture down to the other sections very often. Guests staying in Butler accommodations can call their Butler for a ride instead, and they are transported by golf cart. Another nice perk! I HAVE to talk about The Rabbit Hole. I was so excited when I heard that Sandals added a 1920’s speakeasy to the resort and I loved everything about it! 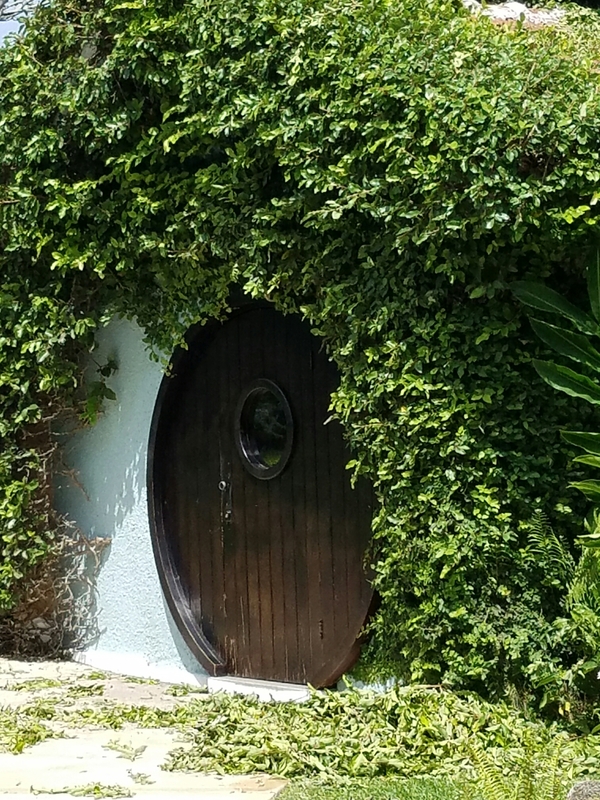 You have to get the daily password from a staff member, and there’s a bouncer at the door who won’t let you in without it. You walk in and Big Mama/Phylea is in there singing her heart out. The bartenders are mixing classic details and people are dancing….it’s just a great time. You cannot miss out on this venue when you visit Sandals Ochi! As much as I loved the Ochi Beach Club on my last visit, this time I found myself gravitating toward the pool. The water was just perfect and the swim-up bar had my name written all over it! Maybe next time I’ll dip in the ocean…. Overall, with a few more years of experience under my belt, there are two groups this resort works well for: those who love a good time/party, as the Oceana Night Club and weekly beach party will keep them happy. I saw many couples hanging out with one another, whether they knew each other before or met on the ride to the resort. The other group I would send are those who want complete privacy. The Butler Villas on the hillside are fairly secluded, and those who book a Romeo and Juliet Suite really don’t need to leave their room for anything. They would love it here. I plan to return with updated thoughts about Sandals Royal Plantation and Beaches Ocho Rios. Also keep an eye out for my review of Beaches Turks and Caicos, my new favorite resort in the entire Caribbean!! !